Look at all those green numbers on the board! 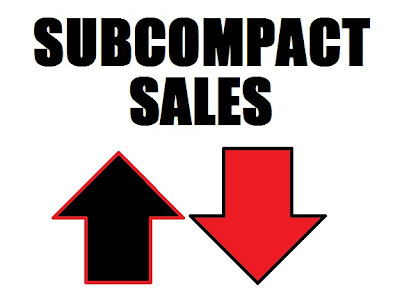 September was a pretty good month overall for subcompacts. The big winner—and by a long shot—was, oddly, the Chevrolet Aveo, which was up 243.8% over Sept. 2009. I am not sure why there was such a spike for the littlest Chevy, but it produced some big numbers. Less surprisingly was the big increase by the Kia Soul, which keeps producing voluminous sales. The big loser this month was the MINI Cooper Clubman, which was down 51.7% vs. this time last year. However, overall, the Smart ForTwo is still down the most overall in 2010. Also of note: Fiesta sales ... some 10,742 of them already. Mazda 2 sales, only in their third month, are also starting to gain steam. I've noticed that Fiesta hatchbacks don't seem to hand around the dealerships at all, but the Ford store down the street from me has a couple sedans that have been in for weeks. How much sooner would Ford have had the hatch on the market if they'd concentrated on that one model at launch, with the realization that they didn't "need" sedans ready until spring 2011 (when the old-model Focuses are all cleared out)?